The door in Xujiahui is completely put into production. It opens a little bit before the train doors open, and closes, when the doors of train carts are completely closed. This may cause the train to stop a little bit longer than before. The platform was cut by about 30 cm to allow the installation of the door. 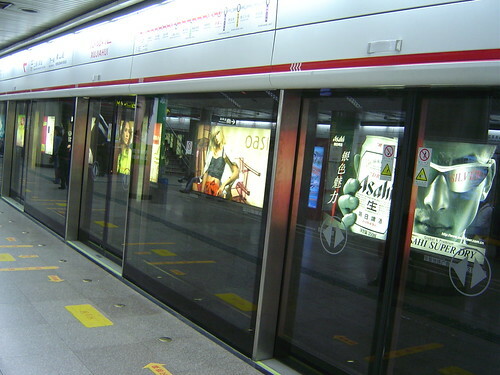 The platform edge was cut in People’s Square, and other stations. Xujiahui is the first to complete the project, with all the stations in Metro Line #1 following. Along with the automatic door, I found some improvement in the Long Yang Road station also. They have many typos, as if Shanghai Metro is as casual and unprofessional as Wangjianshuo’s blog. Recently, they used white tape to cover the wrong translations. It takes time to correctly, but it is the first step to show improvement since I found the error in 2004.
somewhat like metro in shenzhen. 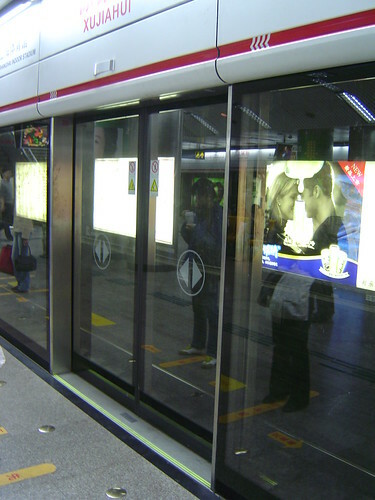 all the metro station in shenzhen have the glass screen between the platform and the orbit. What? HK’s MTR?! You kidding! So now, two years after the project to put doors on line one was announced (and was billed as `to be completed by the end of the year’ in 2004), one station has doors. How long until the rest of the stations get them? ha, guess it! 先下后上. What is it now? Alight first before boarding. Ride with courtesy. A safety measure to prevent failing and suicide. FYI… the newly opened #4 Metro Line has installed glass saftey doors at all of it stops, except for the part where it shares the same stations with the #3 Line (Pearl Line). 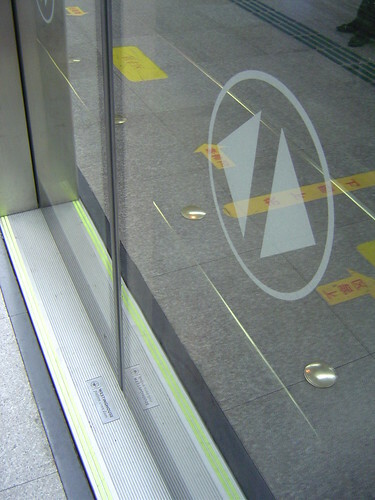 The glass doors in the 人民广场 (renmin guangchang) station are currently disabled. Maybe they didn’t seem like progress any more? Most of the lines have these doors now, except lines 2 and 3. Do you know when line 2 will install them? It’s the second busiest line, but there have been no sign of construction, even in the newer stations on the Songhong Road extension. The trains don’t have Automatic Train Operation yet, so they stop all over the place, as the driver tries to stop at the right place. With all those doors, when are they going to implement that? Those glass doors make me more afraid, then confident that accidents will not happen. I’m just remembering the story of the guy that got torn to pieces when he got caught between a set, glad I wasn’t there to see that…I remember when I was in Japan, it helped keep the suicide rates in subway stations down, but the problem in Shanghai is that it’s so crowded and getting onto the subway at rush hour is so crazy, I really do wait for the next train sometimes, because I’m scared of something getting caught between those glass doors! Outrageous glass work. Really amazing and stunning designs. Always waiting for your updates. Thanks for sharing such a nice stuff.